Nature never sleeps, so the Nature Research Center will open its doors to the public for the first time with a 24 hour celebration rich in activities and entertainment for everyone. 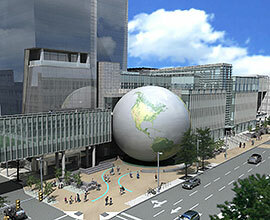 The Grand Opening and Planet Earth Celebration will take place in a four-block area of downtown Raleigh. The North Carolina Science Festival and Planet Earth Celebration are joining in on the fun! Jones Street, Salisbury Street, and the Bicentennial Plaza will be filled with booths with science displays, recycled art, and live bands for 24 hour celebration! For a quick glance at full entertainment schedule, follow this link. The event landscape will stretch along two blocks of Jones Street adjacent to the main building and in front of the Nature Research Center. Salisbury Street from Edenton to Lane Street will complete the venue. Visitors can enjoy activities, presentations, exhibitors and vendors during the 24 hours. The SECU Daily Planet Stage will be set adjacent to the SECU Daily Planet with the Bicentennial Plaza Stage situated next to the Main Building. Special event partners include NASA, the NC Science Festival, and Burt's Bees.